In the movie Armageddon, a giant asteroid is about to hit earth and the whole world watches in terror as a crack team of space cowboys goes up and blows it to smithereens. Whew! Crisis averted. The world cheers. Life goes on. Scientists begin reporting measurements and observations that lead them to believe that a huge asteroid may to hit earth in the next, say, 100 years. The impact will be devastating. People and animals will most certainly die. The earth’s entire ecosystem will change. Life may not go on. Over time, more scientists concur with the observations and eventually there is somewhat of a consensus that yes, a giant asteroid is almost certainly on the path to hit earth. In fact, it will be here sooner than they thought. Maybe 50 years. The only scientific disagreement is around the exact when, where, and global impact of the event. The scientists first go to their nations’ leaders to express their urgency. They present their findings and propose some very expensive solutions. This has to be solved immediately. It cannot wait for our children and grandchildren’s generations. By then it will be too late. This could take years to fix. We need to act now! So all the world’s developed countries get together, put up billions of dollars, formulate a comprehensive plan, form a crack team of space cowboys and together we destroy the enemy! No, instead governments and politicians begin to grumble about costs. Taxpayers, they say, are not going to go for this. Besides, it’s an election year. Maybe there’s another way? In fact, maybe it’s not even a problem. Probably just a liberal conspiracy to raise taxes and infringe on our rights. And besides, other countries should share the burden. Where are Nigeria, Haiti, and Bangladesh for instance? No, we are not footing the bill on behalf of the whole planet. Let those countries take care of themselves. We’ve got people out of work for godsakes! They open with a statement from the committee chair who reminds the audience that humans can adapt. When it’s hot we stand in the shade, so if the asteroid turns out to be real, we can just hide under something. It’s part of the natural cycle of things. A committee member says that he’s kept awake at night knowing that Mars is very similar to Earth, yet the asteroid is not heading there. He worries that nobody has considered this. Astonishing! He thought of something that hundreds of scientists and experts overlooked! What else might they have missed? Asteroid science is not true, says the committee. There’s nothing we need to do. The public is relieved. Phew! The asteroid probably won’t even happen. A vice presidential candidate from Alaska, points out that being so far north, she is probably the closest person to the sky, and she’s not worried. “I can see the moon from my backyard,” she tells reporters, “and I’m telling you, that sky is clear. There is no asteroid.” She writes a book, goes on tour, and shoots a moose. People believe in her. A polemic political commentator puts her law degree to work explaining that science has shown that a little bit of an asteroid may not be a bad thing. In fact asteroids have been crashing into earth forever, and look, they’ve only made us stronger! The crowd cheers. The commentator writes a book, “How to Pretend to Know Science (If You Must)”. She builds a following. Zealous religious leaders blame everyone who doesn’t share their belief. This is god’s punishment for choosing the wrong god (or worse, none at all), being gay, harvesting stem cells, or voting liberal. They check their calendars for the next scheduled rapture, go on TV to raise money, fill their church (and personal) coffers, and wait for god to sort it out. Oh, and being helpful folks, they pray for salvation for the rest of us. A well-known actress declares that there is no asteroid. It’s all part of a Big Pharma conspiracy to distract us. Vaccinations are what we really ought to be looking at. That’s what’s destroying the next generation! Frightened parents jump on board. Vaccination rates drop. Child mortality rates due to preventable infectious disease go up. No children die from asteroids. Parents are relieved. Talk show hosts bring on guests with first-hand information. A man with a backyard telescope reports that he’s never seen the asteroid and he sure as hell has been looking for it. “It ain’t out there, I’m tellin’ ya,” he says on one morning show. The hosts nod appreciatively. Viewers buy $89 telescopes from Wal-Mart and confirm his findings. Another talk show host praises a book by a new age spiritual leader called, “The Power of Wow.” He tells readers that to begin their transformation as protectors of the planet, they must look inside themselves to find their personal “fountain of wonder.” We don’t need space cowboys he tells them. We just need to remember how to feel the inner “wow” we’ve all lost touch with. The host cries. The audience cries. He sells 6 million copies. Everyone thinks, wow. The years drag on. Governments change hands. Asteroid funding comes and goes. Politicians now run on platforms based on their belief in asteroids. An entire cable network devotes itself to “providing a balanced viewpoint” to discredit asteroids. 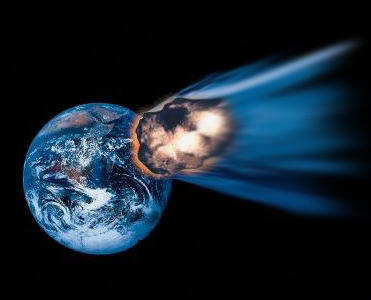 School boards in Kansas and Texas remove asteroids from the Space Science curriculum. Money for scientific research gets diverted to farm subsidies and baling out automakers and the entire banking industry. The space program loses funding. The space cowboys grow fat and are let go, eventually finding jobs as security guards. The scientists continue to shout into the wind. And the asteroid hurtles closer and closer to earth.